Record all your baby’s precious first moments in this beautiful book. Stick in scan photos, write down first words and fill in the funniest moments of their first year. With gorgeous artwork of Winnie the Pooh and his friends from the Hundred Acre Wood. 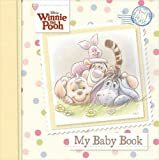 This entry was posted in Parenting Books and tagged Baby, book, Disney, Pooh, Record, Winnie by PIYC. Bookmark the permalink.